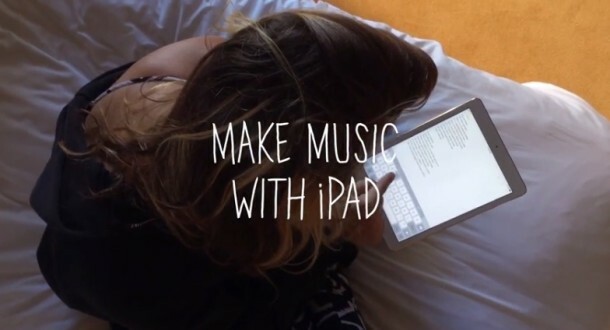 Apple has started to run a new iPad ad focused on creating noise with the device, called ‘Make Music with iPad’. The commercial follows an artist known as “Elliphant” and shows how a song is composed using various apps on the iPad to write lyrics and make a beat. The ad is generally similar to other recent Apple commercials for the iPad that follow various creative endeavors, from making music to films. Apple has made this accompanying website for the ad, showing specifics about what apps were used in the video and production. Oh dear, I thought you were just big daft, but “noise” indeed is an accurate description. Maybe it’s because I’m ancient being on the front end of the millennial generation, so perhaps I am just not in the “cool” age anymore, though I generally think of myself as young still, but on what planet is this music? I’m pretty sure one of the sound effects is the Water Droplet sound effect from the Mac OS X Sounds setting in system preferences. And you know, just loop that with some words, and put some other looping sound effects, and there you go, you made a song! Obviously I am not the target audience for this one, I already own an iPad so I guess they’re trying to appeal to whoever finds this to be an enjoyable noise. Maybe 7th graders, so if you’re a 7th grader, as your parents for an iPad next Christmas! Of course this aired during the Grammys, the music is equally as terrible. Oh listen to you two, this commercial is fine. Just watch it on “Mute” and enjoy! Makes me want to sell my iPad. Lol just kidding. You guys are crazy, iPad Ifa good for all. Thanks Apple for bringing musical standards even lower. This too shall pass. Worthless egocentric crap. Asinine in-your-face stupidity. Big hair dude lifted up his shirt on stage, wow so idiotic. Dumb blonde writes senseless lyrics. Lowest-denominator mold-brain commercialized sandwich meat in plastic containers with no soul or talent. This is our society. One can judge a society by the music it makes. We are decaying frothy scum clinging to the edge of the artistic cesspool of life. Interesting. I saw it and loved it. It sounded like a fun song and she looks like her energy live is electric. Her lyrics make sense if you can understand a reggaeton type voice with a hint of a Swedish accent.